Walking into a customer’s lab recently I detected the tell-tale odor of insulation cooking. One of the engineers I was with said “It always smells like that. You get used to it.” It shouldn’t. Not a good sign. High speed switches, fast network interfaces, and dense processing nodes all dissipate a lot of power as heat. FPGAs are notoriously difficult when it comes to estimating power dissipation. When heat is not adequately removed from a system we know the system will fail at an accelerated rate. It is very important to consider and have a plan to manage thermal issues up front in any new design. Heat can be transferred via three mechanisms: conduction, convection, and radiation. Conduction occurs in solids and the heat is transferred via motion of the molecules. Convection is the transfer of heat via a gas or fluid so by definition it is not possible in a solid. Radiation is the transfer of heat via electromagnetic waves. The sun warms us via radiation. In a packaged chip we get conduction from the die to the surface of the package and then convection from the package surface to the surrounding air. The amount of heat transfer from the case to the air via convection is dependent on airflow. It is important to note that, for both conduction and convection, temperature is directly proportional to the power dissipation and inversely proportional to area the heat is flowing through. In the picture below I’ve depicted a BGA package– the balls are the little circles on the bottom, a chip (clear rectangle) inside a package (crosshatched area) with a heat sink stuck on the top. 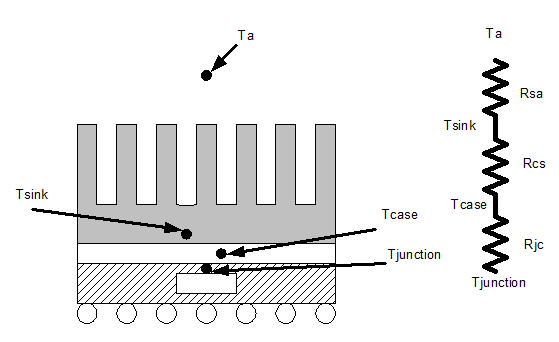 A model of the thermal impedance is drawn to the right. Where Tj is the junction temperature, and Ta is the ambient temperature. Both are in degrees Celsius. Q is power dissipation in Watts. Rja is the thermal impedance from chip junction to ambient air. Rsa is impedance from the surface of the chip to ambient air, and Rjc is impedance from the junction to the chip. Typically, for telecom type systems, the max Ta is 50 degrees C plus a 10 degree C rise inside the box. A typical semiconductor Tj is 115 degrees C. Substituting in these values allows us to calculate the max Rja for different levels of power dissipation. You can see that as the thermal impedance Rja increases the allowable power dissipation drops quickly, assuming constant Tj and Ta. I recommend measuring case temperatures right on the chip package and then using the chip manufacturer’s specified Θjc ( I use the notation Rjc here) to calculate the junction temperature. A good DMM with a temp probe can give reasonably accurate case temperatures in a pinch. There are also thermal cameras and handheld infrared heat detectors with laser sighting for those with a bigger budget. You can see that the junction temperature will track the case temperature closely (within a degree) for power dissipation of 5W and under. Above 5W it gets difficult to get the heat out of this package so the die temp is gonna rise and the failure rate will increase. Working through, and managing these issues up front in a design cycle will save you from a lot of headaches and a smelly lab. This entry was posted in Embedded Knowledge, FPGA SoC by Administrator. Bookmark the permalink.